Train commuters in the German capital, who would like to take the track towards environmental protection, are getting the opportunity to do so in the scope of the campaign “My mug for Berlin”. Cyber-Wear produced 13,000 sustainable, ultra-light and reusable coffee mugs made of bio-degradable, fast regrowing bamboo for the Deutsche Bahn subsidiary, S-Bahn Berlin. The lid and the heat protection banderole are made of silicon. Furthermore, the banderole also reminds the user in which supermarkets the mug can be used to save money on purchasing coffee: Because in addition to the logo of S-Bahn Berlin, it is also embossed with the logos of the partner supermarket chains Bio Company and Marktzeit, where an up to 0.20 Euro discount is available on every hot drink if the bamboo mug is used. The ecologically valuable and dishwasher-safe coffee-to-go cups can be purchased in more than 54 locations, whereby all proceeds beyond the purchase price are donated to a good cause. 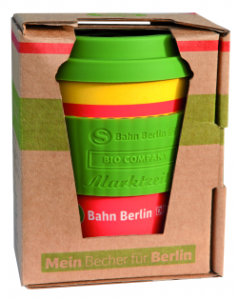 The fact that the DB Bambus-Coffee-to-go mug suits the promoting company down to the ground – because as part of the public transport network, S-Bahn Berlin stands for eco-friendly mobility in the capital city – earned the campaign a distinction in the category Best Practice in the Promotional Gift Award 2017. Furthermore, the discounts that one is awarded on implementing the mug are a real incentive especially for regular train commuters – who can have a clear conscious on top.